Yada yada yada another bubble popping game ties up a successful franchise and hope it makes it's all to similar game stand out from the crowd. This time it's the BBC's Top Gear show that add some car graphics to help sell this mobile game. To be fair I haven't played it but just looking at the screenshot it does look all too familiar... No wonder the Stig hides his face! Free-to-play mobile release Top Gear Road Trip, based on the world’s greatest motoring show Top Gear, will launch globally on the App Store for iOS on 17th August and on Google Play for Android devices later this summer. Featuring 120 levels, Top Gear Road Trip is a casual action packed match-three racing game, that allows players to join the official BBC Top Gear team in an adventure across the British Isles and Europe, playing classic challenges inspired by the TV show and building a collection of cars to compete against friends, enemies and frenemies. The game’s match-three control mechanics with mid core gameplay elements, enables players to progress on a map from England to France, through the Alps, Italy and onwards on a road trip saga. Strategy, planning and car tuning are essential to win the puzzle races and reach various levels. 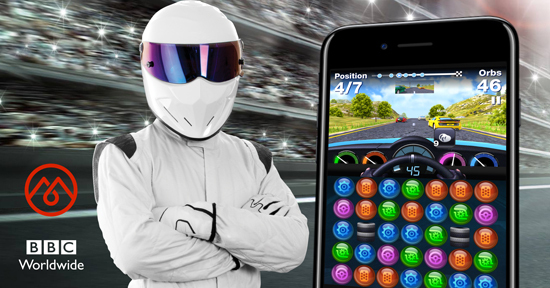 The game also features Top Gear Challenges, where players attempt to beat their own records and build a dream car collection for competitive play. Alternatively players can race fellow drivers in a league format to compete Top Gear Challenges, including the infamous Rocket Robin, Toyboata and Burnout challenges.